Choose from a selection of 41 holiday rentals in Scarlino. Use the search form to the left to filter the results and pick your choice of self catering accommodation in Scarlino. We have a good selection of holiday apartments in Scarlino perfect for family, single, romantic and group holidays. You may prefer to take a look at our listed holiday villas in Scarlino or holiday apartments in Scarlino. Find your holiday homes by a specific type using the property type drop down in the filter. Filter the holiday homes in Scarlino by a specific area using the area list above. Just a few minutes from the sea, this delightful holiday apartment is set among the houses of the ancient village of Scarlino for an unforgettable romantic break. Holiday apartments with simple but functional furniture 3 km from Scarlino and from the sea of Follonica. Semi-detached house consisting of living room with kitchen corner and sofa bed, a double bedroom, a twin bedded room and a bathroom with shower. This cosy holiday home is located in a residential building, which is home to only four apartments. 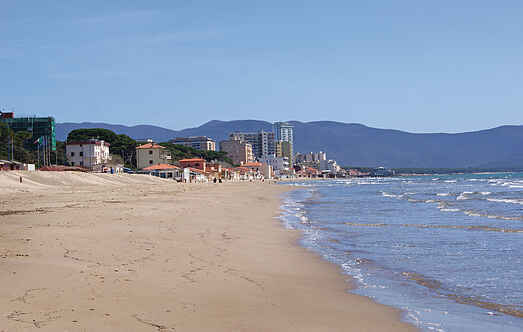 It is situated on the slopes of a hill, in a holiday resort on the Gulf of Follonica. This holiday village with bungalows is situated in the heart of the Maremma area, on the slopes of Mount d'Alma in Scarlino, only 7 km from the Tyrrhenian Sea. Holiday home located close to Scarlino, at only 4 Km from the sandy or pebbly beaches, deep in the green countryside, with large garden. This large villa is set at just 2 km from Scarlino, a medieval hamlet in the Tuscan Maremma area. This holiday apartment is located in Scarlino, in the heart of the Tuscan Maremma. Cala Violina, Castiglione della Pescaia and Follonica are just a few of the beautiful seaside resorts that you can visit from this apartment in Scarlino.